Research On Snacking – What Does It Mean? This year I have read a couple of research studies every day around the areas of fat loss, nutrition, exercise or the psychology of body transformations. It is important to keep on top of the latest science behind fitness. My book reading currently is focusing more on the neuro-psychology behind weight loss as well as specific population treatments, e.g. bulima etc. I will write a couple of book reviews in due course. A couple of interesting studies I read last week looking at the issue of snacking. 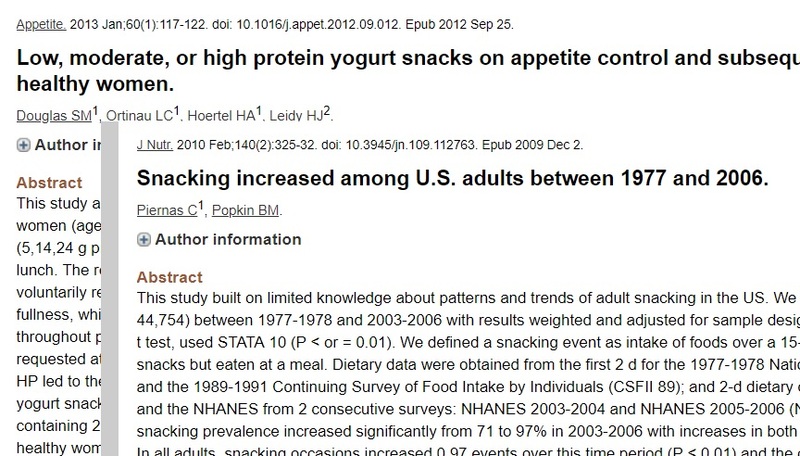 One was about whether adding a higher protein Greek yogurt snack helped with hunger and reducing food intake. The study interestingly showed that adding 160 calorie snack of higher protein yoghurt did reduce hunger feelings and increased contentment. However, it did not reduce overall food intake with those having the snack eating more in the day than those who did not. In another study they reviewed the eating habits of current day verses the past in terms of frequency of eating and snacking. It was comparing eating in 1977-78 to 2003-2006. The results showed we had gone from an average 3.5 times a day eating to 5 times a day. Time between eating had dropped by an hour on average with most people eating every 3 hours. The data also showed a significant proportion of calories was now being consumed through beverages compared to previously. This happened alongside the biggest rise in obesity humanity has ever seen. These studies point out the essential point of modern day lifestyles. We eat too often and eat too much. One of my early focuses when working with people one on one here in Battersea is to retrain them around food and hunger. Modern day life has conditioned us to always be eating or drinking. This ethos is backed by healthy snacks & healthy water intake mantra which supports this behaviour. However, no one discusses the other side to the coin which is how unnatural it is to always be putting something in your mouth every couple of hours. It can seem confusing once more about whether you should be eating regularly or not. You need to understand that there are no rights or wrongs in most health advice and the key is identifying what is applicable to you. It is easy to see how this situation came about, certain populations overly influence the advice for getting in shape. Bodybuilding is one of them, if you were to follow a traditional clean body builder diet it is really hard to eat enough food in a day e.g. tuna, potato and green veg only. However, it is easy to overeat if you start changing those foods for modern day meals and snacks. There are other situations where frequent eating may be the best approach for you, those with unstable blood sugars (as in tested for with glucometer), people with binge eating patterns may also do well on more frequent eating. Athletic populations also can easily make an argument for frequent eating. However, if you are the average person doing average amounts of moving you are eating too often. In this case working on reducing the amount of times you eat and drink would be beneficial. Need Support Getting In Shape?